Hong Kong’s aviation market is approaching an important juncture as Cathay Pacific prepares to acquire the low cost airline HK Express and starts to consider long term options for expansion following the 2024 opening of a third runway. HK Express will increase Cathay’s share of seat capacity in Hong Kong from approximately 45% to 50% and finally give one of Asia’s largest airline groups a play in the faster growing bottom end of the region’s booming aviation market. Cathay is poised to become the 17th full service airline in Asia Pacific with an LCC subsidiary but is not late to the game in terms of the Hong Kong market, which has an LCC penetration rate of only 12%. Cathay Pacific is in the last year of a three-year transformation programme that has already resulted in a financial turnaround. Driven by significant yield improvements, the airline group was back in the black in 2018 after two years of losses. Cathay Pacific has been able to grow revenues despite slot constraints by improving yields and pursuing long haul expansion. Regional capacity is also growing, albeit modestly, through upgauging. The third runway will open up a new wave of regional growth opportunities – at both the full service and low cost ends of the market – as well as the possibility of introducing smaller aircraft. Cathay is considering taking advantage of the third runway to expand its fleet by approximately 50% – or 100 aircraft excluding HK Express – and could place a new batch of aircraft orders as early as this year. Cathay Pacific is preparing to acquire HK Express – Hong Kong’s only LCC. Cathay Pacific and its cross-equity partner Air China are the only large airline groups Asia Pacific that do not currently have an LCC subsidiary. Without HK Express, Cathay would need to wait until at least 2024 to launch an LCC, given the slot constraints at Hong Kong until the planned third runway opens. HK Express will give Cathay Pacific approximately a 50% share of the Hong Kong market, matching rival SIA’s share of the Singapore market. Singapore is a similar market and is also building a third runway but has twice as much LCC capacity as Hong Kong. Cathay Pacific is the largest airline group in Asia Pacific based on current international seat capacity. It has marginally more capacity (less than 1% more) than the Singapore Airlines Group. The Cathay Pacific Group and the Singapore Airlines (SIA) Group both carried 35.5 million international passengers in calendar 2018. AirAsia and Korean Air are the third and fourth largest airline groups in Asia Pacific based on international seat capacity. However, the AirAsia and AirAsia X groups combined is slightly larger than Cathay Pacific or SIA. Cathay Pacific is not as prominent when Asia Pacific airline groups are ranked based on total seat capacity (domestic and international); it barely makes the top 10. However, this not really a relevant comparison, given the fact that Cathay does not have a domestic market and has a very large long haul operation. When ranked on total ASKs (domestic and international), Cathay Pacific is number six in Asia Pacific. What stands out when the largest airline groups in Asia Pacific are compared is Cathay’s lack of an LCC subsidiary or affiliate. Cathay, along with Air China, are the only full service airline groups in the top tier without a low cost brand. Cathay and Air China are equity partners; Air China owns a 30% stake in Cathay and Cathay owns an 18% stake in Air China. Over the past few weeks Cathay has been in talks to acquire HK Express and is expected to announce the acquisition formally soon. Cathay's acquisition of HK Express will finally give Cathay an LCC subsidiary and Air China an LCC affiliate. The number of airline groups in Asia Pacific with LCC subsidiaries or affiliates will increase from 16 at the moment to 18. Three other noteworthy Asia Pacific airline groups without LCC subsidiaries are Air New Zealand, Malaysia Airlines and Philippine Airlines. However, they are much smaller than Air China or Cathay, and by most metrics are just outside the top 20 airline groups in Asia Pacific. HK Express is part of the Hainan Airlines Group (HNA) along with five mainland Chinese LCCs – Air Guilin, Beijing Capital Airlines, Lucky Air, Urumqi Air and West Air. HNA also owns Hong Kong Airlines, a struggling full service network airline that is generally considered a low fare competitor but not categorised as an LCC. HK Express adopted the LCC model in 2013 as it rebranded from its original name – Hong Kong Express. HK Express currently operates 24 A320 family aircraft, which makes it the 24th largest low cost airline in Asia Pacific (based on fleet size). HK Express is the 36th largest LCC in Asia Pacific based on total seat capacity but is 16th largest based on international seat capacity. HK Express accounts for 5% of total seat capacity in Hong Kong and more than 40% of total LCC capacity in Hong Kong. The LCC penetration rate in Hong Kong is a very modest 12%, which is well below the global and Asian average. HK Express is Hong Kong’s first and only local LCC. The market is also served by 20 foreign LCCs. The AirAsia Group and Cebu Pacific are the largest foreign low cost competitors; each accounts for nearly 14% of LCC capacity in Hong Kong but a less than 2% share of total capacity. 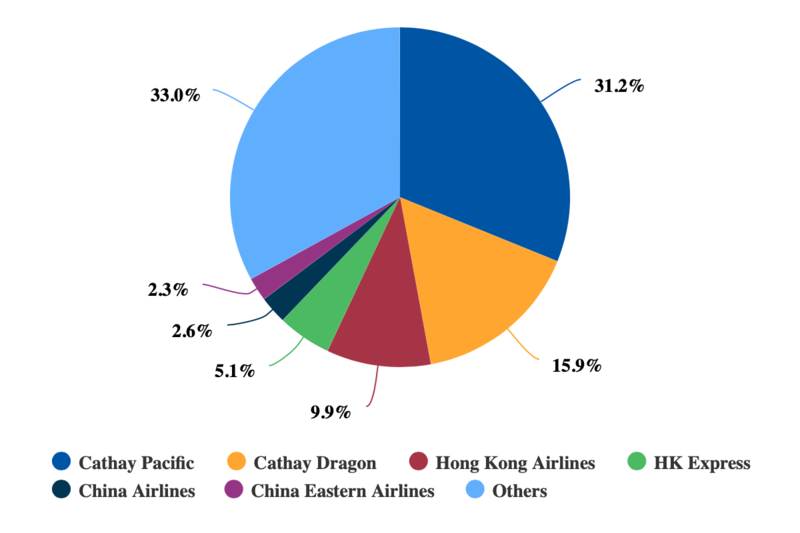 The Cathay Pacific Group accounts for a 46% share of seat capacity in Hong Kong (based on CAPA and OAG data for the week commencing 25-Mar-2019). This includes a 31% share for Cathay Pacific and a 16% share for the regional full service airline Cathay Dragon. HNA is the second largest airline group in Hong Kong but is much smaller, with a 15% share. This includes a 10% share for Hong Kong Airlines and a 5% share for HK Express. None of HNA’s mainland Chinese subsidiaries currently serve Hong Kong. HNA has been considering selling its stakes in Hong Kong Airlines and HK Express as the struggling group tries to raise capital and reduce debt. Cathay Pacific emerged in early Mar-2019 as one of the investors considering HK Express. Over the past few weeks Cathay reportedly has been in exclusive talks to acquire HK Express and is expected to announce the acquisition formally this week. HK Express would boost Cathay’s capacity share in Hong Kong to 51%, which should be viewed as acceptable by competition authorities. The SIA Group accounts for exactly the same amount of capacity in Singapore; the SIA Group’s 51% share consists of a 30% share for SIA the parent airline, 13% for its LCC subsidiary Scoot and 8% for its regional full service subsidiary SilkAir. There are several markets globally of similar or larger size where the flag carrier or largest airline group enjoy a much larger share of total seat capacity. However, Singapore is the best comparison for Hong Kong, since they are similar markets in the same region without any domestic flights. Hong Kong and Singapore are both major financial centres. Hong Kong is slightly more populated – almost 7.5 million compared to almost 6 million for Singapore – but Singapore’s GDP per capita is 24% higher. The Hong Kong and Singapore aviation markets are also similar. Both have an approximately 40%/30%/30% breakdown in terms of inbound traffic, outbound traffic and sixth freedom (transit) traffic. The two hubs compete for sixth freedom traffic. Sixth freedom passengers account for approximately half of total traffic at the Cathay Pacific and SIA groups; this is higher than the broadly 30% average for the two hubs as other airlines rely mainly (but not entirely) on local traffic. Hong Kong and Singapore also compete to some extent in attracting the same visitors. Hong Kong and Singapore both attract approximately 14 million annual visitors by air. Hong Kong has another 41 million annual visitors arriving by other modes (from mainland China and Macau) and Singapore has another 4 million annual visitors arriving by other modes (from Malaysia and Indonesia). Both are in the process of constructing third runways to support further growth over the long term. Both airports are expected to transition to a three runway system in 2023 or 2024, boosting runway capacity by approximately 50%. Both airports are also planning to open new terminals, although the opening of the massive fifth terminal in Singapore is not expected until 2033 or so. Hong Kong and Singapore both now face capacity crunches but the situation at Hong Kong is more severe. In Singapore there are still available slots at off-peak hours, whereas in Hong Kong there are virtually no available slots. This is an advantage for Singapore and the SIA Group, which continues to grow its fleet and number of flights (mainly at Scoot). Hong Kong passenger traffic has grown by only 3% per annum in the past three years (2016, 2017 and 2018). 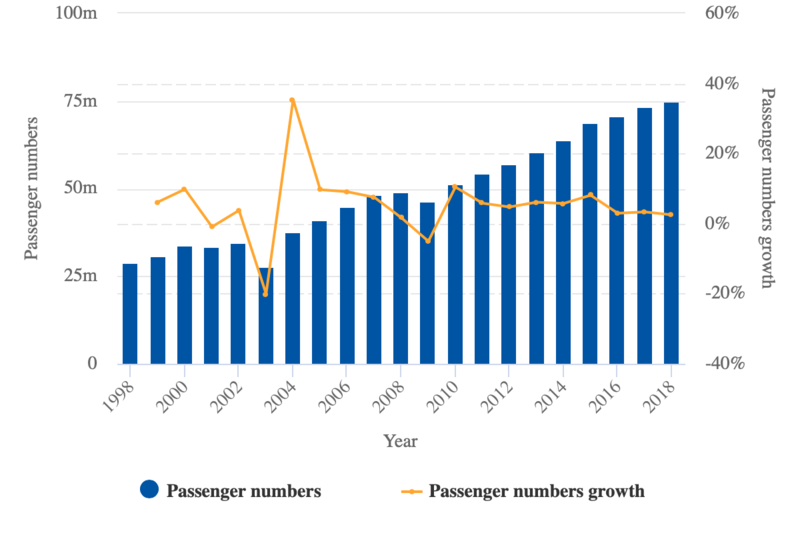 Passenger growth was much faster in the first half of this decade (2010 to 2015), ranging from 5% to 10%. Source: CAPA - Centre for Aviation and HKIA reports. 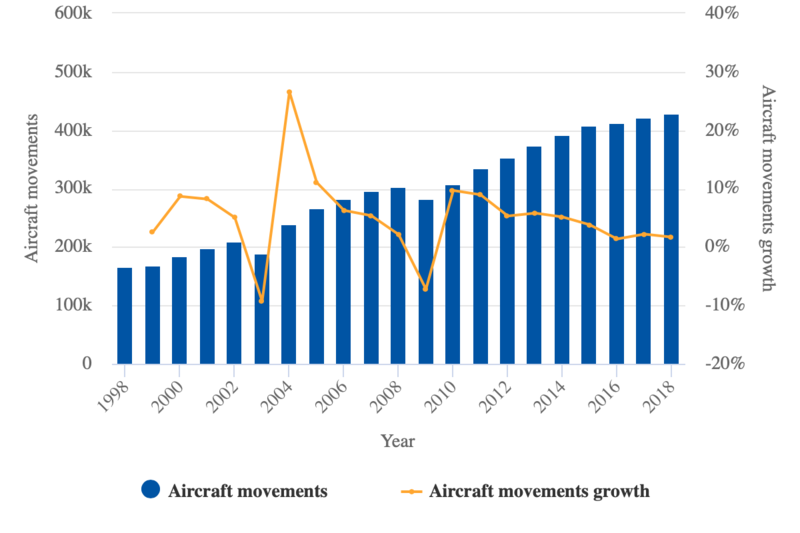 Aircraft movement growth at Hong Kong has slowed to approximately 2% over the past three years. Growth in movements has been consistently slowing since 2010, when movements increased by 10%, as infrastructure constraints have intensified. In comparison, Singapore passenger traffic has grown at a consistent 6% per annum rate the past three years (2016, 2017 and 2018). Growth was slower in the three preceding years (2013, 2014 and 2015) but was higher – in the low single digits – in the first three years of this decade (2010, 2011 and 2012). Aircraft movement growth has been 4% over the past three years – an indication that there are still some available slots. Hong Kong handled 428,000 aircraft movements and 74.7 million passengers for 2018. Singapore handled 386,000 aircraft movements and 65.6 million passengers in 2018. Singapore can continue to squeeze out some additional flights – although not a large number – before the new three runway system is introduced. These figures also highlight that Hong Kong has a higher proportion of widebody movements than Singapore (given the larger passenger per movement figure for Hong Kong). This is partially due to Hong Kong’s relatively small LCC presence as most LCC movements are with narrowbody aircraft. LCCs currently account for 31% of seat capacity in Singapore, compared to 12% for Hong Kong. Singapore has more than twice as many LCC seats as Hong Kong, whereas Hong Kong has 40% more FSC seats. Hong Kong’s LCC penetration rate is unlikely to increase until after the third runway comes online. Singapore’s LCC penetration rate will likely reach 35% by the time Singapore’s third runway fully opens, driven by expansion from Scoot. While for several years Cathay Pacific has refrained from launching an LCC subsidiary for strategic reasons, congestion at Hong Kong has also been a factor. Without the potential acquisition of HK Express it will be difficult for Cathay to launch an LCC subsidiary before 2024 as it would not want to sacrifice existing slots. The opportunity to acquire HK Express essentially enables Cathay to accelerate by at least five years its entry into the low cost space. Cathay announced on 5-Mar-2019 that it was “in active negotiations about an acquisition involving HKE”. The group did not provide any details during its annual results briefing on 13-Mar-2018 but is expected to provide more details when formally announcing the acquisition. This announcement reportedly is imminent. HK Express could become an important component of Cathay's post turnaround strategy. Cathay returned to profitability in 2018, following two years of losses, and is now in the final year of a three-year restructuring programme. Group revenues surged by 14% in 2018, offsetting a 9% increase in fuel costs and an 8% increase in other costs. 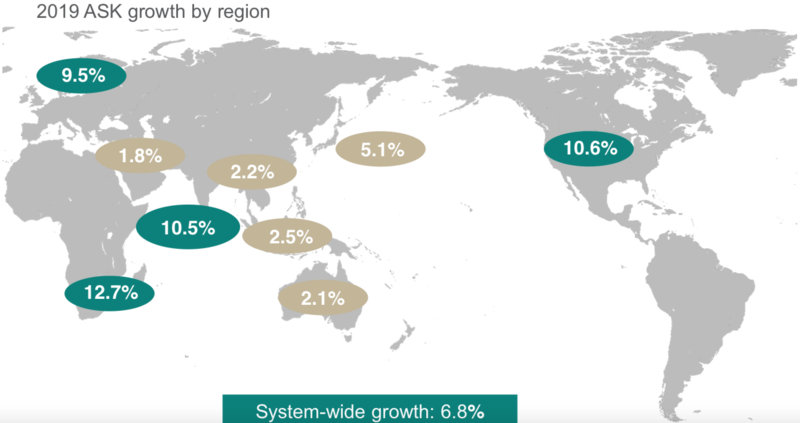 Cathay Pacific benefitted from a recovery in the cargo market, driving a 20% increase in cargo revenues. Passenger revenues increased by 10%, despite only a 2% increase in passenger traffic and a flat load factor, as its passenger yield improved by 7%. The yield improvement is noteworthy – given that regional competitors have continued to experience yield declines. Strong premium demand, particularly in the local Hong Kong market, contributed to the yield increase, along with improved revenue management and the reintroduction of fuel surcharges. Cathay Pacific is pursuing relatively fast long haul growth, partially by reallocating slots that had been used for short haul flights. Cathay increased ASKs to Europe by 10% in 2018 as Brussels, Copenhagen and Dublin were launched. It expects ASKs to Europe to increase by another 10% in 2019. ASKs to the Americas, which were flat last year, are increasing 11% in 2019. Cathay Pacific is launching services to Seattle in late Mar-2019 and the late Sep-2018 launch of Washington Dulles is also driving ASK growth for 2019. Total ASK growth of 6.8% is projected for 2019, nearly doubling the 3.5% ASK growth from 2018. Source: Cathay Pacific 4Q2018 results presentation. Cathay Pacific is also able to continue growing regional capacity by upgauging. Although the number of regional flights is declining slightly in order to free up slots for new long haul flights, increased seat density more than makes up for this reduction. 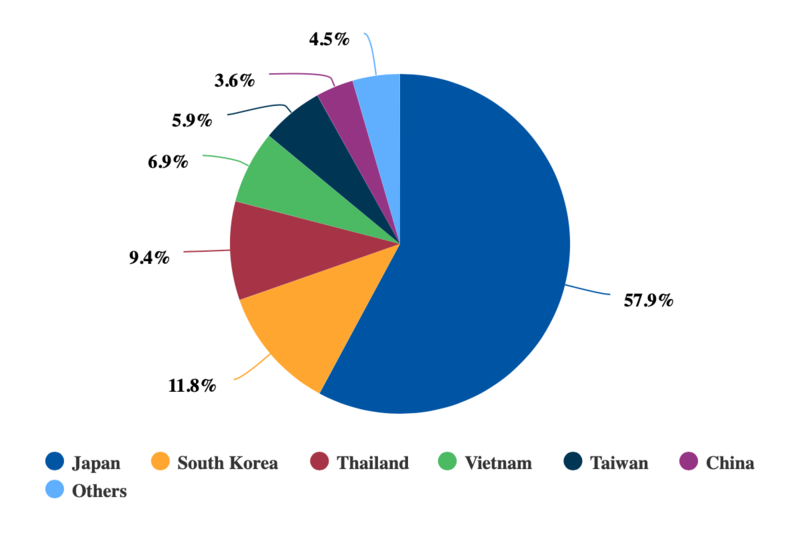 ASKs within Asia were up slightly in 2018 and will be up again in 2019 – although lower than the system-wide increase. The focus on upgauging or densification will continue until the third runway opens, enabling modest capacity growth in the interim period. The 777-9X will become the largest aircraft in Cathay’s fleet when the first of the type is delivered in 2021. Cathay Pacific has already been increasing density on its existing 777 fleet through a retrofit programme that began last year and is slated to be completed by the end of 2019. With the retrofits, Cathay is switching from nine to 10 abreast in economy for both regional and long haul 777-300ERs. Regional capacity will be boosted in 2020 to 2023 as the group is configuring its new fleet of A321neos with slightly above 200 seats. Cathay Dragon’s current fleet of A320ceos and A321ceos, which have only 164 and 172 seats, are being phased out as the A321neos are delivered. High density A321neos are ideal, given the slot constraints in Hong Kong – as well as most primary and secondary airports in mainland China. Cathay Dragon has 23 destinations in China, which accounts for 58% of the regional airline’s seat capacity. Cathay Pacific has only two destinations in China, accounting for less than 4% of its seat capacity. Cathay’s 2006 takeover of Dragonair, which was rebranded Cathay Dragon in 2016, was driven by a need to improve the group’s presence in mainland China. HK Express has only one destination in mainland China. HK Express is heavily focused on Japan, which accounts for 59% of the LCC’s capacity. Japan is also Cathay Pacific's largest market, accounting for 15% of its seats (excludes Cathay Dragon). Japan accounts for nearly 12% of Cathay Pacific Group's seat capacity (includes Cathay Dragon). HK Express’ Japanese operation is more synergistic with Cathay’s Japanese operation than overlapping. HK Express can be used by Cathay to access secondary Japanese cities; HK Express serves six (and soon seven) Japanese destinations that Cathay does not serve. Cathay can also use HK Express to pursue growth in the main Japanese markets by segregating the two brands. Several Asian airline groups now successfully have both full service and low cost brands on regional trunk routes. HK Express currently operates a fleet of 11 A321ceos, eight A320ceos and five A320neos. Cathay Pacific could grow HK Express over the next five years through upgauging to A321neos. It could also potentially grow HK Express by reallocating slots within the group, but this is not likely because the group needs these slots for its existing full service operation. The opportunity for significant fleet expansion at HK Express will come in 2024 as the first batch of additional slots is distributed. Having HK Express in its stable will enable Cathay Pacific to pursue rapid growth at both ends of the market as the new slots become available – likely in phases over a few years. Cathay Pacific has already been preparing for a significant acceleration of its growth rate for 2024 and beyond. HK Express will become another component of this expansion plan, helping Cathay Pacific to improve its long term position. The group has, broadly, been looking at increasing its fleet by 50% following the opening of the third runway. The group currently operates a fleet of 184 passenger aircraft, according to the CAPA Fleet Database, and has 69 aircraft on order, all of which are intended as replacements before the completion of the third runway. Cathay Pacific has not yet ordered any growth aircraft for its post third runway expansion phase. However, it has been planning on broadly 100 additional aircraft for growth and could start placing orders as early as this year. This excludes HK Express, which would require 25 aircraft for growth based on the same metrics but significantly more if the decision is made to grow the low cost brand faster than the full service brands. The number of aircraft ultimately required will also depend on the narrowbody/widebody and short/long haul mix. Cathay Pacific could consider adding some smaller gauge single aisle aircraft, which would enable it to launch new secondary destinations within Asia and add frequencies to existing destinations that are now served less than daily. While not having any aircraft with less than 200 seats is sensible in the current constrained environment, the dynamics change significantly once the third runway opens. Hong Kong and Cathay Pacific need the third runway to grow and compete effectively. Inevitably Hong Kong and Cathay Pacific would lose transit traffic to other hubs and airlines without this step change in capacity. Cathay Pacific also needs to join its Asian peers with an LCC subsidiary in order to compete effectively and fully reap the growth opportunities in its home market as the additional infrastructure comes online. There is no denying that the bottom end of the market is growing faster with the rapid expansion in Asia’s middle class and income levels. This is true for Asia overall, and would be true for Hong Kong if it were not for infrastructure and other constraints. The Cathay Pacific Group could have waited until 2024 to launch an LCC. However, the opportunity to jump-start a new multi-brand strategy with HK Express was too good to pass up, and Cathay could not risk HK Express being sold to a competitor.